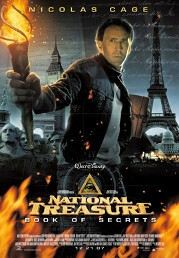 2004's National Treasure did so well that Disney decided to make it again, using the same director, mostly the same cast, and a clone of the storyline. This time around, our hero is trying to clear his great-great-grandfather's name, as he was blamed for offing President Lincoln. The search for the truth about the secret book and the city of gold takes them to London and Washington, where they kidnap the president. Expect plenty of Jerry-Bruckheimer-style action scenes and a plotline which disappointed the critics. The crowds are likely to be impressed. Didn't we steal this scene from Tomb Raider? Comments Some action adventure suspense, moderate threat and mildly complex plot which might need parental guidance.